I am completely addicted to being busy. I’m currently very busy being un-busy and let me tell you, I’m loving it. It’s a bit of a change, it’s a little different to how I’ve rolled over the past 3 years, but it had to be done. The realisation that I had to slow down hit me recently while I was overseas in London with my mum. I had just decided on what my next big project would be, and I started to go through the motions. Grabbed my notebook and pen, started furiously writing out my ideas, notes and explorations into the how, why, what, when and then of course started writing a list of everything my designer would be creating for me in order to launch this new project into the world. I started to feel a little stressed out, and I was only 15mins into My Next Big Thing. The second warning sign was when I stood up from this little brain-dump/brainstorm and I felt a huge wave of fatigue. Not a rush of excitement, or happiness, or inspiration. Just fatigue. A ‘loud and clear’ message from my body, brain and soul, saying (not so quietly) slow down. It’s also important to note this rush of a new idea landed in my mind in the middle of my Cleansed eCourse, so I hadn’t even recovered from what a big, beautiful job that was. I realised it was now my time to slow down a little. I wanted to give myself a big break, a rest cycle, after coming out of months and months of creating my eBooks, meal plans, eCourses, and more. As soon as I made this decision to be un-busy, I felt a great lightness wash over me. It was exactly the opposite of what I had felt when I was brainstorming my next new project. Now, to be fair, this project is pretty awesome and it’s likely I’ll release it in the next year anyway. But the timing has to be right. My energy has to be right. And my intention full of purity and lightness. Not stress, rushing, striving, proving, and definitely no declaring how busy I am. Question: How do you know when you’re addicted to being busy? Being busy is sometimes seen as a badge of honour, or proof we are continually moving forwards to towards our goals and dreams. I’m not someone who likes to sit and wait, but I’m slowly becoming to realise that enjoying a slower pace of life (as slow as once can be in the city) is a big key I was missing. A key to success, to happiness, health, balance and hopefully, abundance. Life balance is a myth, and the pursuit of it is causing us more stress than the craving for balance itself. My mum tells the story of when I was little, maybe 3 or 4, I was playing with one of my friends when her mum asked me if I wanted to sleep over that night. I said I didn’t, and when she asked why, and told me my little friend would love to have me sleep over and play, I confidently told her “I’m the boss of me” and I had decided not to sleep over. I was 3! I want to be the boss of me again, instead of being bossed around by time, schedules, to-do lists, mental clutter and cyclic, running lists of things I think I should do. While I love ‘moving forwards’, writing, creating and releasing new projects and resources into the world, I want to make friends with time. Oh and space. And freedom. And whole afternoons off. I don’t want to be too busy. But too busy? Not so much, no. So when I recently made the decision that it’s time to be un-busy, and allow other areas of my life, self and personality to enjoy being centre stage, my shoulders came down, my breath slowed, my heart eased and my mind softened. Now, I realise it’s totally possible to be addicted to being busy, because being busy is fun and exciting and exhilarating. As LaPorte points out, being busy is seen as a badge of honour; it shows the world you’re doing it, you’re really doing it. But what are the fall-outs of being busy? Helping clients heal from adrenal fatigue, fatigue, burn-out and the consequences of high levels of stress is one of my main focuses in my practice. My clients are busy people. They often feel starved of time. They often feel they don’t get to exercise enough, or meditate enough, or cook an abundance of healthy food. Being busy robs us all of so much, yet it’s hard to see the end in sight. How did I know I was running in circles being too busy? What about if we took that notion, of something being ‘once in a lifetime’, and applied it to our everyday life? Say your best friend calls you right before you’re about to sit down to finish a report and you think “Oh gosh, way too busy to speak and see how her weekend was, this report needs to be finished now.” Well, your friend will never call again at that exact moment with her news of her weekend. You’ve missed that moment, and that report can in no way replicate or give you the love and friendship and gratitude you’d feel had you picked up the call. 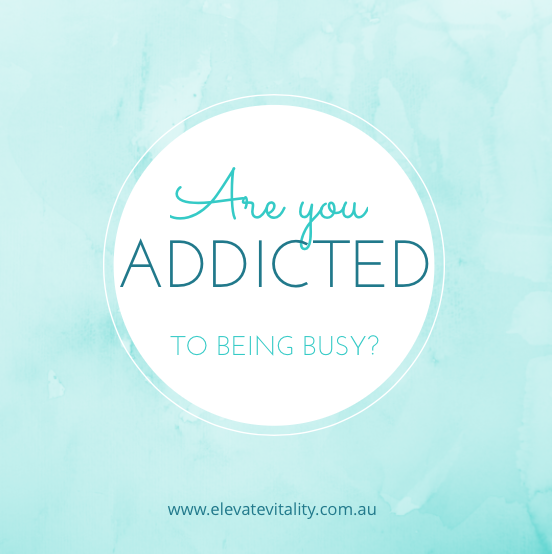 Being addicted to busyness is a way of putting on your spiritual blinkers. Being busy holds you back from being the best version of yourself, because it prevents you from seeing areas of your life and personality that perhaps you don’t want to see. When I get off the hamster wheel of busyness, I’m forced to notice what comes up for me when I’m not busy… What’s left in the silence are the things I don’t necessarily want to look at: Like… how uncomfortable I am with feelings of boredom. Or how afraid I am of being ordinary. Or how I tend to feel unworthy and unlovable unless I’m overachieving. Here’s the honest-to-goodness truth: a part of my (high-achieving, perfectionist) self thinks that if I’m not writing my next eBook or releasing another eCourse or creating new offerings for you, my lovely clients and readers, then what am I doing? If I’m not moving forwards, then by definition, I’m stagnant, or worse, moving backwards. No. Thank. You. That kind of thinking is way off the mark. That kind of thinking leads to guilt, fatigue, burn-out and chocolate. Not my kind of wants (except, maybe some chocolate). I’d go for respect over guilt, vitality over fatigue and ability over burn-out, any day (and in fact, everyday). It’s time to stop being so busy. Danielle LaPorte recently wrote a Stop Doing List, and reading it made me shiver with excitement. The idea of giving yourself permission to unload your schedule, hustle less, and empty your plate from being too full, that is what a light heart feels like if ever I felt one (and I did, when I created my Stop Doing List). Here’s my list. What’s on yours? 1 :: Stop feeling guilty for slowing down. Make friends with inaction. You can write as many Stop Doing Lists as you want. You could even write one for each different area of your life. There’s no right or wrong. Just write a list, and see how you can weave it into your life. There’s beauty in trying, in taking imperfect action, and trusting that you’re exactly where you’re supposed to be. The alternative is you feeling stressed, overloaded and overwhelmed. I’m so over that; are you? I’m not saying don’t have big dreams and don’t try to excel at your job. I’m simply saying that we shouldn’t allow professional success to define us. We’re more than our to-do lists. And we don’t have to wait until we get a corner office for our lives to have value and meaning. We can thrive wherever we find ourselves right now, and being exactly who we already are. You’ll never feel ready to be un-busy; you have to decide to become unbusy. There’ll always be ‘stuff’ to do, to-do lists to cross off, groceries to be shopped for, laundry to be washed, beds to be made, emails to be replied to, and dogs to be walked. But you have the option of creating more un-busy time in your life by just declaring it. I’m leaving work at 6pm to make it to a family dinner. I won’t be answering work emails this weekend, but my auto-reply is set. I’m disconnecting from social media this week as it’s consuming me. I am hiring extra help around the house/business/studio because I need more time for myself. I’m waking up earlier to exercise. I’m going to 7am yoga, lets push back that conference call. Once you un-busy your life, you’ll see others near you might do the same. Or perhaps they’ll glare at you a little funny, for a little while, and then join in on the fun. They’ll join in on your yin, and soften their yang. They’ll agree that yoga classes beat self-imposed limitations and deadlines, any day (and in fact, everyday). And if they don’t? You can continue to create your own un-busy rules. (Tweet this!) Slowing down is the new black. Time is on your side. It’s malleable, bendable, moldable. Making friends with time is a conscious choice, just like exercising, meditating and eating well. How can you become un-busy? Where can you carve out some time for yourself each day, and every week? How can you slow down? Are you keeping busy to keep up with someone else? To hide from something? Or do you need to relearn how to slow down and look after yourself? Share this post with a busy friend and be un-busy together. Bliss.